My at-home version did not look like this, keep in mind. 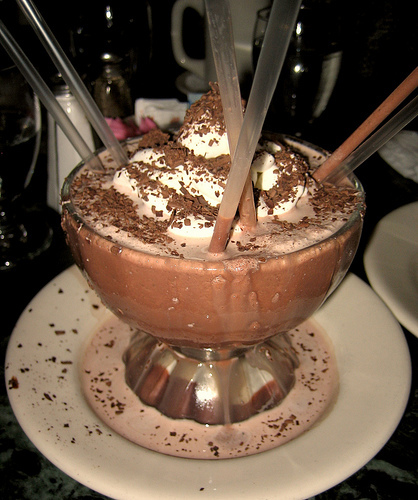 This is the frozen hot chocolate that they serve at Serendipity 3 in New York. I've only tried to go to the restaurant once, and the line/wait was much too long so I left. I only really wanted to go so that I could try one of these since I've heard how good they are. Anyway, I found out that you could buy the packets online and make them at home (providing you have a blender - a good blender, too - one that crushes up ice well), so that's what I did instead. Verdict? Really goddam good. I don't see how the made-in-the-restaurant version could be any better, really. Just tasty as hell. And enjoyed in the comfort of my own home no less! The packets come in a variety of sizes and you can buy them on Amazon. It's $8.95 when you order it at the restaurant, but the serving size is good for at least two people they say (they also have a peanut butter version at the restaurant). Also, have you seen the movie Serendipity? Man. I don't even like movies like that and I loved that movie. Just delightful as hell. The likable John Cusack? Get outta here, he's so great in it.